If you were on a roadside picnic in Sweden in the mid-1950s, you and your basket lunch of herring in reindeer sauce may have been transported in one of these. 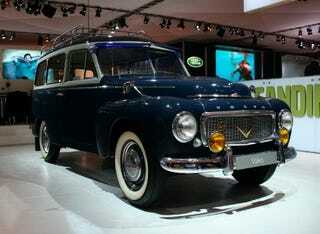 It's the Volvo Duett, a wagon also known as the P445. The perfectly restored model, complete with wood-slat cargo area, took center stage at Volvo's Tokyo show display, reminding us that quirk once existed in material form, not just in the minds of advertising executives.